Nandina (Nandina domestica): growing, planting, caring. A shrub with a flashy coloured foliage. Nandina domestica - the nandina - is a species and the only member of the monotypic genus Nandina in the family Berberidaceae native to eastern Asia. It is an erect evergreen shrub up to 2 m (7 ft) tall with numerous, usually unbranched stems growing from ground level, glossy, bi- to tri-pinnately compound leaves - brightly coloured pink to red in Spring before turning green, and white flowers, borne in early summer in conical clusters held well above the foliage. Nandina is considered invasive in some states in the US. Easy ! It's a shrub with narrow branches, an erect habit, bearing persistent leaves divided into pointed leaflets. The summer bloom is creamy white, turning into red berry. The foliage changes color in the fall to become coppery or red. Plant in the fall or spring, in fresh or heavy soil, non-calcareous, rich, in the sun or partial shade. Allow one meter between each plant, knowing that development is slow. No need to prune during the planting, simply dig a hole twice the size of the root ball without mixing the layers, plant and reseal the hole by putting the layers of soil in order, adding a little compost to the ground. Tamp the soil around the roots with your foot. Form a hollow for watering matching the volume of two watering cans. Sprinkle. In pots, find a container at least 40cm in diameter, which you fill with compost and loam, with gravel at the bottom. Water regularly and copiously for a few weeks after planting. After, you will have to worry about watering only if your nandina is in pot, or during droughts. If you keep your nandina potted, plan a re-potting every 2 to 3 years, in some potting soil and a slightly larger pot. 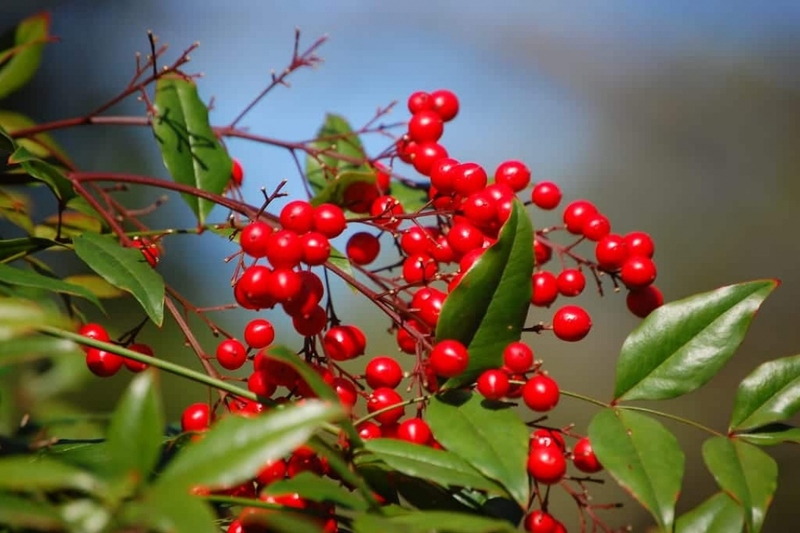 The slow growth of Nandina incites to prune it slightly, unless you want hedges.